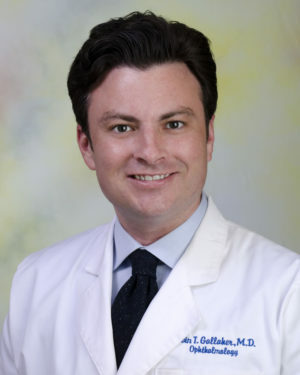 A Knoxville native, Dr. Gallaher returned in 2011 to East Tennessee after having completed his three year ophthalmology residency at the University of Mississippi Medical Center. Highly educated, he received his undergraduate degree from the University of Tennessee, Knoxville, and his medical degree from the University of Tennessee College of Medicine in Memphis. He is a board-certified ophthalmologist. While in his second year of practice, in 2013, Dr. Gallaher was selected by his peers as one of “Knoxville’s Top Doctors” by Knoxville CityView Magazine. To stay up-to-date with the latest in his field, Dr. Gallaher is a member of the American Academy of Ophthalmology and the American Medical Association. Dr. Gallaher specializes in cataract surgery, ocular surgical procedures, treatment of eye diseases and injuries including macular degeneration, diabetes, and glaucoma. He also performs routine eye exams for glasses and contact lenses. In his spare time, Dr. Gallaher enjoys the outdoors, DIY home improvement projects and playing tennis.